Plans to move to tablets? Hi @mikey. I know you’ve said in the past that you are concentrating on the Fire Stick but are there any plans recently to move towards tablets? 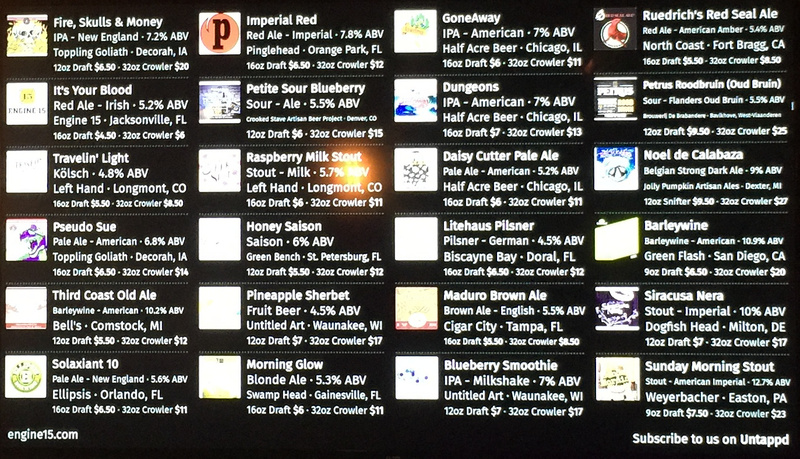 With the popularity of tablets nowadays they make a great and easy way to share a Taplist around a bar or home bar. Currently the program works but not quite right on a tablet. It would be ace if it was optimised for the tablet market. I bet after Mikey gets through this upcoming major release he’d be able to get the Taplist.io digital beer menu app working on the newer Fire tablets. For a tablet (or personal smart phone) in a bar, restraurant, brewery, brewpub, … I assume you’d want a more interactive experience with the ability to search / filter through potentially hundreds of beers based on country / state of origin, style, ABV, IBU, draft / bottle / can, … Of course, both the digital beer menu app and mobile app would leverage the same beverage database. Mikey may choose to develop a Taplist.io mobile app to compliment the Taplist.io digital beer menu, however, anyone could develop the mobile app. Why would you want to search through 100s of beers? You’d only want the ones that are on in the bar you are in. I’m not talking about a Untappd type service but something a server could show customers to see the beers that are available. In time and with development, the server could also use the tablet for orders and Taplist could develop a For Business options. I was in a World of Beers on Saturday. They had literally hundreds of beers. WoB has a nice mobile app I have on my iPhone. This particular WoB had chalkboards and printed menus. Printed menus are outdated before the ink dries. My wife and I were each given a printed menu and they weren’t even the same. 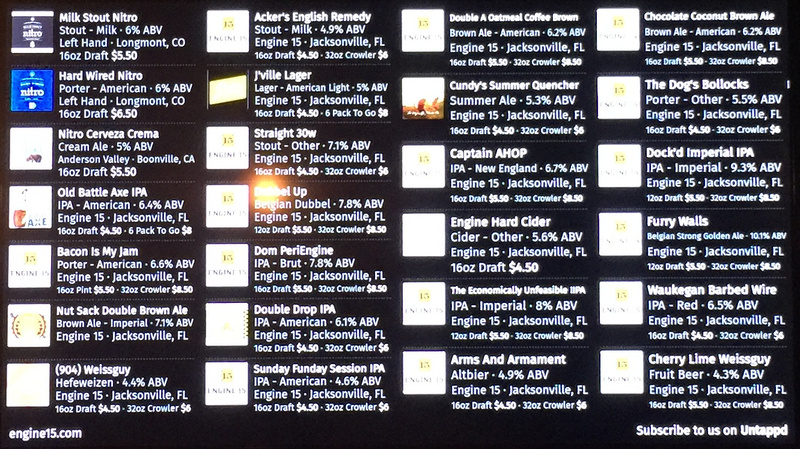 The combination of a digital beer menu integrated with a mobile app is the only way to fly. That’s exactly what I’m talking about … something a server could show customers or something customers could access on their own smartphone. Your Beer Menus & Events, Published to Millions of Beer Enthusiasts. Even with the digital beer menus, you still benefit from having a mobile app. 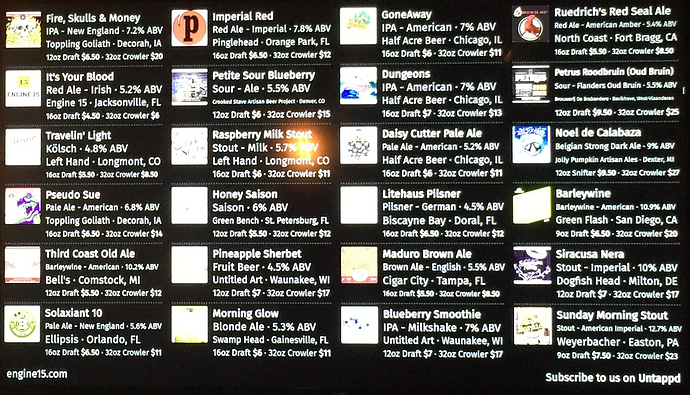 There’s only so much information you can fit on a television screen with near 30 beers on it. Well, that’s a little different. 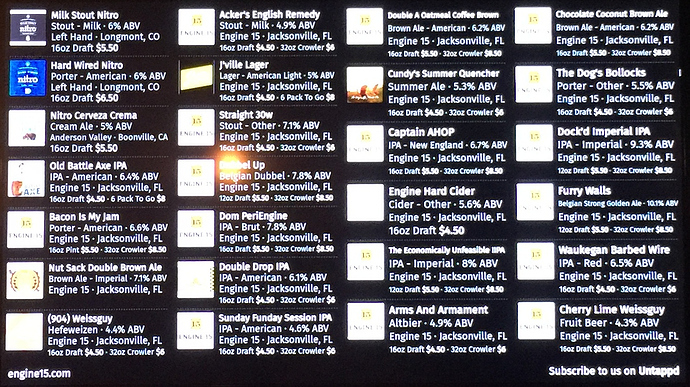 The Yard House in Orlando has a tablet like this, along with the search / filter capabilities I described. Close to a hundred beers. With Taplist.io’s rich database and the API Mikey is about to expose, a mobile app is relatively straightforward. We should probably start there.